This is a tale of the supernatural. In Venator the player is Gilbert, the youngest in the long line of mummies, vampires and ghost hunters of the Penumbrus family. However, he doesn’t share the same enthusiasm and ability for the profession as the others before did. 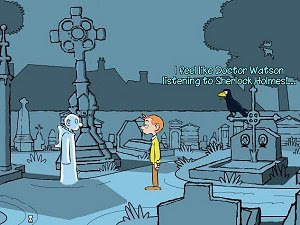 With a nice and clean cartoon look, this is a free adventure game with a talking raven serving as a companion for Gilbert. The game unfolds during nighttime, with blue shades acting to great effect while the characters remain with full color. Gameplay uses the classic point and click interface and to progress the player has to solve inventory puzzles and some riddles.